The Type D durometer tests the hardness of hard rubber and plastics. To obtain accurate readings using a durometer, one must develop a proper “feel” for the gauge. Rex Gauge Co.’s Test Block Kit for D durometers gives the user the ability to develop the proper “feel”. While not to be used for calibration purposes, the kit also enables the user to perform a quick check for the proper operation of the durometer. 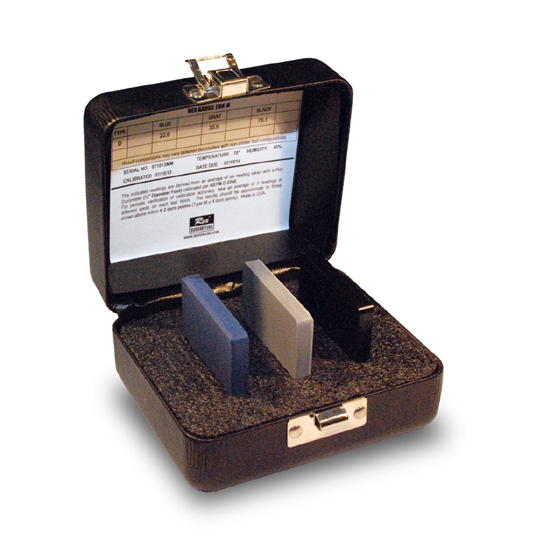 The kit consists of three color-coded test blocks each measuring 1/4″ x 2″ x 2″. The Kit is furnished with a sturdy magnetic-latching carrying case with the true readings for each block on the inside cover of the case. A certificate of calibration is also included for users who need documentation of traceability to NIST.